A typical meeting with a lecture and discussion in the Club Library. Our Library contains over 5,000 books of all types, any of which can be checked out by members. A complete listing of titles can be accessed on the Library page of this website. People with common interests meet to participate in numerous activities―currently numbering about forty. 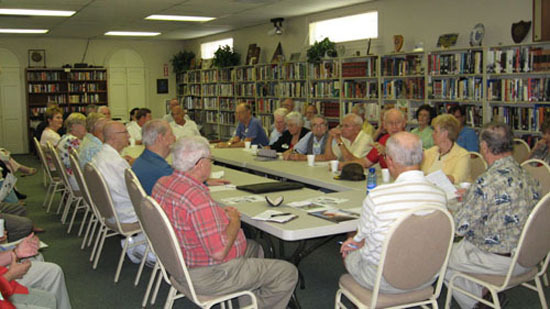 Activity groups are based upon members’ interests and are administered by club member volunteers. Meetings are held during the daytime and in the evening. Brief descriptions of each activity follow. Schedules may change periodically, so please refer to the detailed monthly calendar that is included in each issue of the monthly Club Times. The various Intellectual Activities are open to the public. Per Club policy, nonmembers are asked to pay a $5.00 activity fee each time they attend. This group has speakers and views videos related to art appreciation and art history. An eclectic selection of publications in all genres selected by attendees who read the selection and participate in discussions. There are three sessions on three different books each month: fiction (morning session), non fiction (afternoon session), and general (evening session). A review is presented twice a month by members who discuss a book of their choice. Both fiction and non-fiction books are presented. Lively, interactive question-and-answer sessions follow each review, often inspiring members to read the book. The traditional card game with friends. This is a monthly film series featuring award-winning movies of various genres, documentary, classic, and foreign favorites. 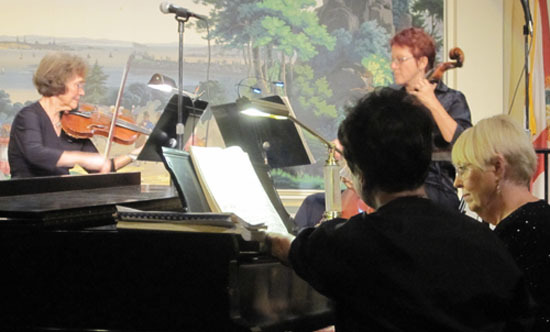 A monthly afternoon program featuring performances by acclaimed musicians, followed by a question-and-answer session. The University Club Chorus rehearses weekly in the spring and fall for performances at Club events. New participants are welcome; no previous experience is required. A weekly meeting devoted to creative projects such as beading, knitting, and much more. Individuals desiring to learn a new craft or demonstrate something creative are encouraged to join. A weekly meeting of participants who discuss relevant issues of the day in a friendly, roundtable forum. A monthly presentation of award-winning documentary films that cover important events and topics including science, history, culture, military, and much more. A discussion of national and international economic topics. A monthly program designed to encourage discussion and debate in global challenges of our times. Syllabus based. French Conversation: A bimonthly meeting of individuals with a basic knowledge of the French language. German Conversation: Discussion group for German speakers, covering general topics related to Germany, Europe, and the United States. Italian, Beginners: Fundamentals for speaking and reading Italian. Spanish, Advanced Beginners: Ideal for those with some prior study of Spanish. Especially targeted for those who want to improve their grammatical skills in a relaxed, academic setting without tests or grades. Spanish Conversation: A meeting of individuals who have had the experience of living, working, and traveling abroad in Spanish-speaking countries. Topics discussed in Spanish include recent civic events, historical episodes, and personal experiences. 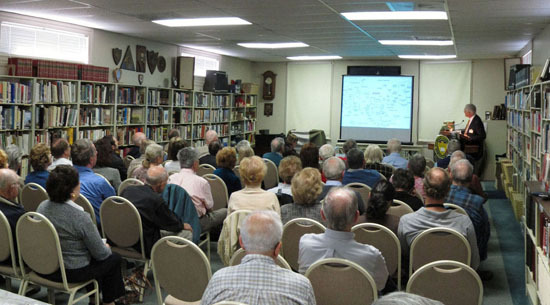 Expert genealogists and informative forums make up these popular sessions. 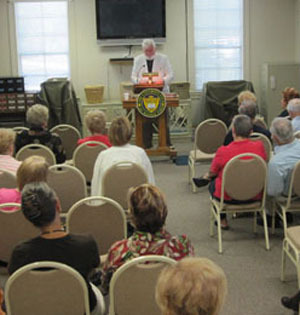 The meetings are held on alternate months in conjunction with the Central Florida Genealogical Society. A discussion of the possibility that intelligent life forms visited the Earth thousands of years ago. Lecture presentations on topics of cultural and historical significance. Often the presenters have first hand knowledge of the subject. The history sessions are one of the most popular activities. Question-and-answer sessions follow each lecture. Discussion of ideas and strategies for investing in the stock market. A group meets twice a month to play Mahjong. In the philosophy group, broad philosophical issues (which may feature a professional speaker or a video recording) are presented, followed by an amicable round table discussion among participants. The humanities group usually has an outside speaker, often a professor from one of the nearby colleges or universities, followed by discussion. Topics range from advances in understanding the workings of the human brain to preserving Florida wild life. Scripts are provided at meetings. No experience necessary. Lectures and discussions of health, science, and technology issues. May include a lecture by a professional in the field. Local sports figures come to the Club to discuss activities. The focus of this group is on classic literature from the list of Great Books of the Western World. Monthly meetings to discuss relevant issues of the day in a friendly roundtable forum. Each month, a DVD of an independent and/or foreign-language feature film is shown in a casual environment. Insightful discussions occur before and after the film. 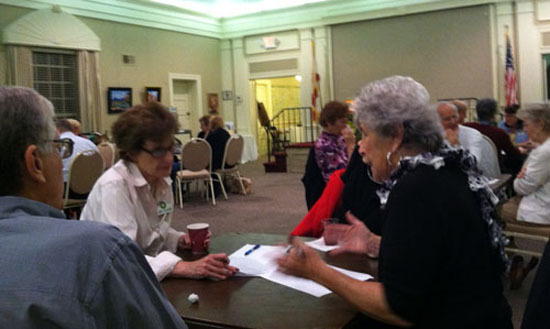 Monthly meetings of speakers from the University Club and the Orlando Florida Writers Association Group provide useful information for amateur and professional writers and for aspiring authors. Recordings of opera classics, from Aida to Zauberflote, are presented and discussed. Immediately prior to the performance, a brief overview of the libretto and arias is presented. A discussion of emerging technological trends and how they impact today’s society. A popular evening of information quizzes where individuals and teams compete only for the honor of winning, and perhaps an occasional prize.